And hate 'em — because it's so hard to get back on track with healthy eating when you get home, right? Most people either follow the 80/20 rule when eating out on vacation — or fall off the wagon completely. So they got home unmotivated, tired, and even a little depleted. I feel for you, Cathy! Practically every one falls off the wagon while on vacation! If you're interested in learning easy ways to cook healthy every day, be sure to grab my free traditional cooking video series! I share 5 of my favorite fundamentals traditional cooking techniques — they're easy, healthy, and delicious! “His mercies are new every morning…” God's word says. Same with food and health. Tomorrow is a new day. Or in Trim Healthy Mama, where every snack/meal is 2-1/2 to 3 hours apart, the saying is you get to start over in 3 hours. That's great news and very encouraging! Your extra tiredness is not only from traveling but it’s from not being nourished as well. It’s ok to admit this. Because it helps you find the motivation you need to make changes. Know that it’s going to take some work to get back on track. Set your mind that you’re pursuing that and prioritizing it. When you get home, you need to recover from vacation before you can get back to normal. That means 3 things — rest up, drink up, and eat simple, nourishing meals. The first 2 are obvious. The next — what do I mean by simple, nourishing meals? Grass-fed ground beef based dishes — ground beef is so easy to turn into hamburgers, spaghetti, tacos, burritos, chili! Make sure your ingredients are whole and nutrient-dense: healthy fats, grass-fed or pastured meats, especially. The fat and protein will help fuel you and restore your vigor. Also, feel free to use healthy convenience items, like: store-bought yogurt, artisan ferments (like Bubbie’s), sourdough bread, canned wild salmon, etc. You might have some nice take-out places that feature seasonal ingredients and broth. Don’t turn to fast food because you’re tired — either simple at home or quality eating out. Notice in triage there’s not a whole lot of soaking/sprouting/sourdough. Just basic whole foods that don’t need extra prep methods. This is because you’re resting and restoring and we’re keeping it very simple. Once you’re rested up, rehydrated, and even nourished, you should begin feeling more energetic and more desire to get back in the kitchen and back to normal. So do it. But do it slowly. Don’t burn out. Start introducing more tasks and cooking. Whatever you were doing before vacation, you can do again. And use your Instant Pot! We have tons of easy recipes in our Pressure Cooking eCourse — if you’re not already a member, consider joining us! If you can plan ahead for the next time you vacation, you'll not only make your vacation better but also your return home. There are 3 parts to this. 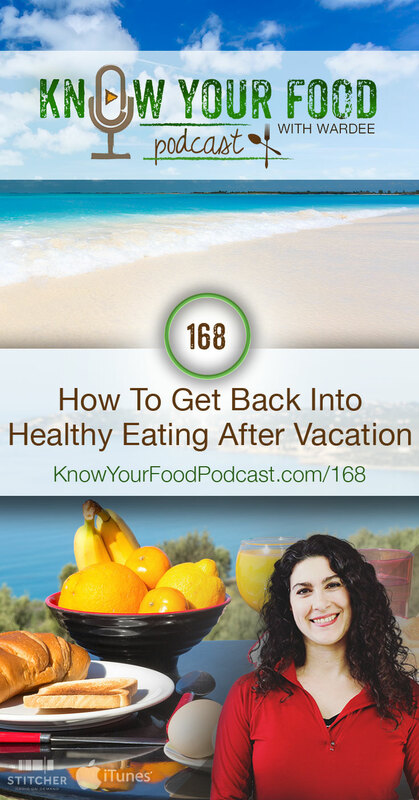 #1 — How can you make your next vacation better in terms of how you eat? Check out this #AskWardee — real food while traveling. Vacation is like having a baby. You don’t return to normal for awhile. So just like new mamas clean and put up freezer meals for when the big day comes, you can do the same thing when you know you’re going on vacation. This also includes: Try to leave for vacation with a clean house, clean fridge, and almost everything “in its place”. When you’re home again, the last thing you want to do is have to pick up messes. It’s much better to start with a clean slate. Right? #3 — Plan an extra day or 2 after vacation as a buffer where family activities are low-key or non-existent, so you can rest and recover before going back to work or going back to normal. Great encouraging tips. Now, just to implement, and we’ll be on our way to improving the challenges of dily living disruptions. Thanks!